Happy November all. 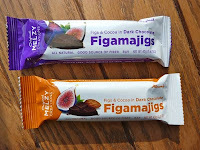 Today was the last day of Chocolate, Date and/or Fig Theme Week. These made-in-California Figamajig (bar) creations from Melzy Enterprises, Inc. (San Mateo, CA) tasted (and in fact were) nutrient dense* and satisfying, with a well-balanced blend of moist dried fig and cocoa inside a dark chocolate coating. The Almond bar, a variant on the Original flavor, also contained almond pieces. 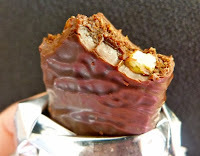 *Each gluten-free bar contained iron, fiber and calcium. Figs also are a source of "Vitamin B6, potassium and manganese."